Tonight’s quick bread was meant to be a sidedish, but it stole the spotlight from the bowl of red (chili) it accompanied. 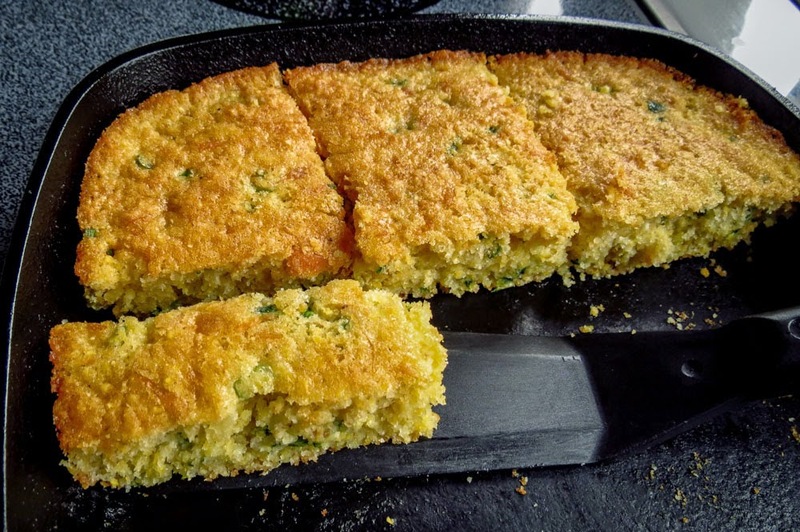 Moist and sweet, a bit cheesey with just a hint of chile tang, this crunchy, light-crumbed cornbread didn’t require any butter or honey to be a “just one more, please” bite of delight. 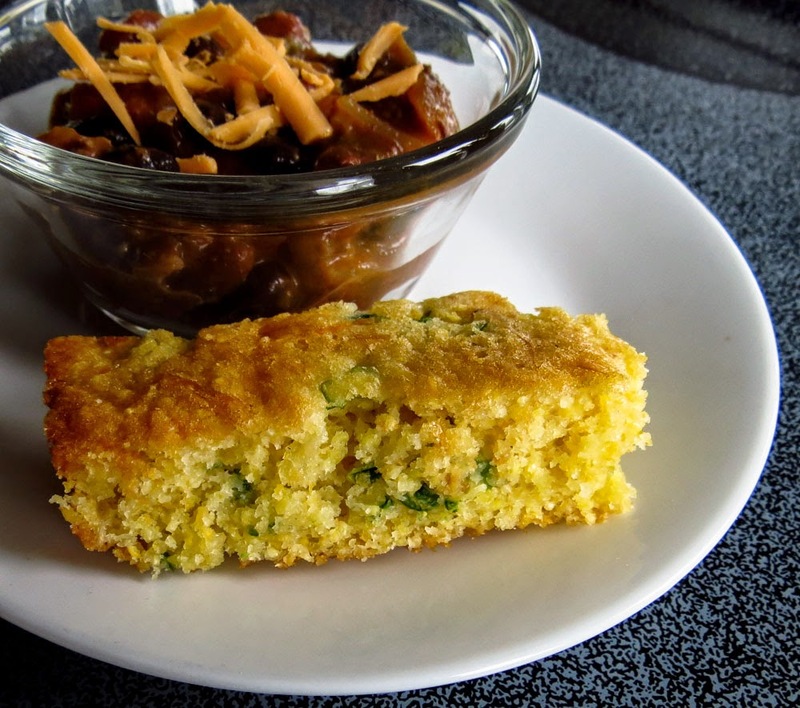 Sound the bell, there’s a new winner topping the Best Cornbread Ever list! I baked this batch in a preheated 9-inch cast iron skillet, just because I love an extra-crispy edge. 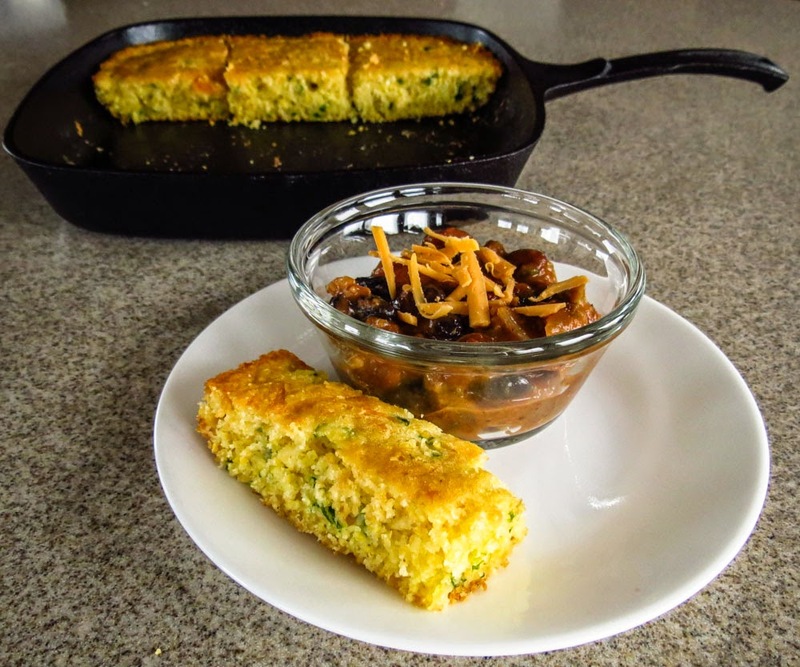 A standard 8x8-inch baking pan, metal or glass, works equally well to produce a tasty cornbread. Muffin tins or a heavy popover pan are two other suitable choices. Pick your favorite, but certainly give this recipe a try. Your "I don't care for cornbread" family members and friends might become cornbread lovers after their first reluctant nibble. Honest, it's just that good. Preheat the oven to 350 degrees F. Oil a cast iron skillet or lightly coat an 8x8 baking dish with cooking spray. Wet ingredients: Use a large mixing bowl and stir together the melted butter and sugar. Whisk in the beaten eggs and milk. Add the chiles, cheese and onion and stir until mixed. Dry ingredients: Whisk together the flour, cornmeal, baking powder and salt in a medium bowl, blending thoroughly. Add the flour mixture to the eggy batter and stir until smooth and well combined. Pour the batter into the prepared pan. Bake on a center rack in the preheated oven until a toothpick or tester poked into the center of the cornbread comes out clean, about 35 to 40 minutes. Remove from the oven and let the cornbread rest a few minutes, until the edges pull away from the pan. Cut into 9 squares and serve warm. Note: a few leftover squares made a great base for sautéed sweet peppers and onions at breakfast. Why is it that MY oatmeal cookies are sometimes flat and other times puffy? This isn’t a “BIG” question, but it has puzzled me. 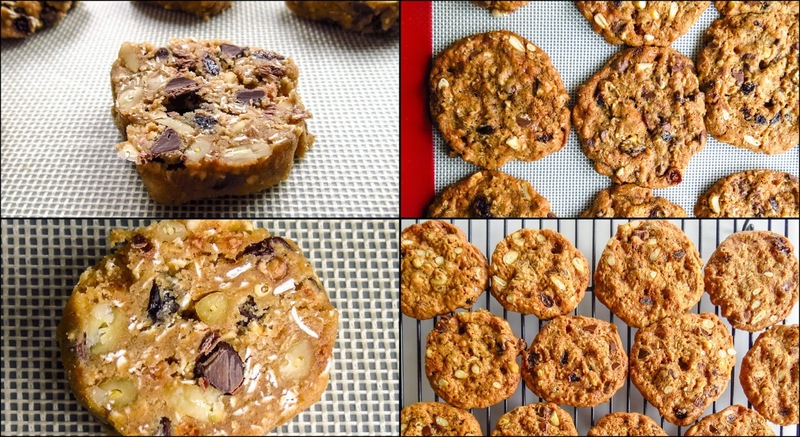 Does the temperature of the dough affect the spread of a cookie? Might it be a matter of light brown sugar versus dark brown sugar? Will a scoop of dough behave differently than a slice of dough? Could it be a “beat until fluffy” issue? An investigation was called for, checking out one factor at a time. I began with dough temperature, chilling one sausage-shaped roll of dough overnight in the refrigerator and freezing another roll. After slicing and baking an equal number of cookies from each roll, I found little difference in the flat/puffy comparison. Both versions flattened out somewhat, spread a little and yielded the same crunchy texture. Cookies from the frozen dough were baked without defrosting and came out of the oven looking a bit more uniform. I did, however, confirm that frozen cookie dough is much easier and tidier to slice than merely cold cookie dough, and both are w-a-y less messy to handle than working with room temperature dough. 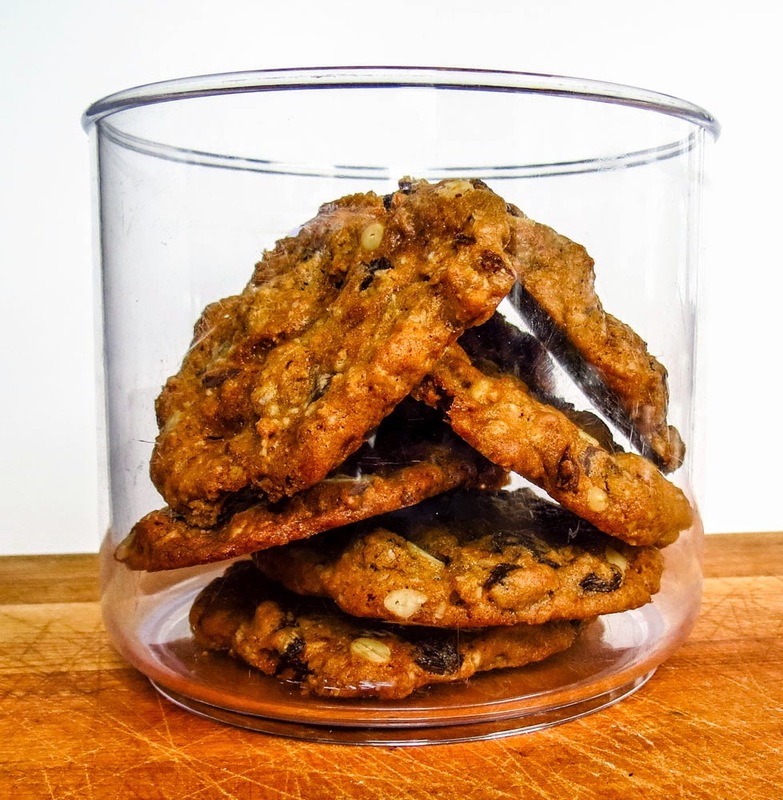 However you choose to form them, this oatmeal cookie recipe with nuts and chocolate yields really tasty cookies. C'mon by and sample a few. Warm cookies are irresistible and they make great "dunkers" when cool. They should freeze well, but this batch disappeared out of the cookie jar quickly. Various taste testers always came back for seconds or thirds. Nope, I still don’t know the answer to my flat vs puffy question, but dough temperature obviously isn't a factor. This calls for further study, an investigation that could take several weeks and many more batches of cookies. Preheat oven to 350 degrees F. In a large mixing bowl beat together butter and both sugars until smooth. Add egg and vanilla and beat until blended. Add the chocolate bits and nuts and mix to distribute evenly throughout. Method 1: drop tablespoon-sized portions onto parchment or silpat-lined baking sheets, spread 1 ½ to 2 inches apart. Flatten slightly with a fork. Method 2: roll the dough into a cylinder, wrap in plastic wrap and chill for several hours or days or freeze and hold. When ready to bake slice ½-inch slices off the roll of dough and place 1 ½ to 2 inches apart onto parchment or silpat-covered baking sheets. However you formed the cookies, when ready to bake place in the middle of a preheated 350 F oven. Bake for 12 minutes, or until the cookies are golden (not brown). Cool the baking sheet on a baking rack for several minutes, then use a spatula to remove the cookies to a baking rack to cool completely. Store tightly covered for a few days or freeze to hold longer. 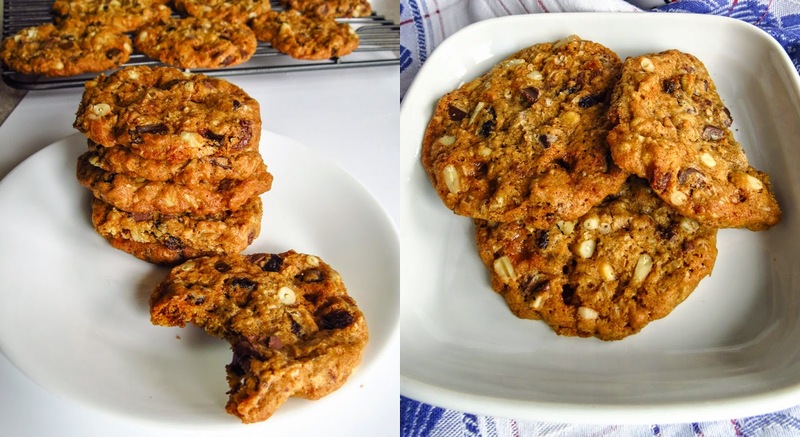 Note: I'm still searching for the original base recipe source for these cookies and will update the credit when I find it. Reminder to self to take better notes! !